Today the annual Ham Radio Convention was held in Apeldoorn, it is the event for everyone who likes to experiment with (amateur)radio. Besides lectures and a componentsmarket there where exhibition stands to present several organisations and VERON commissions. For the first time PI4YLC joined the Traffic Bureau exhibition stand. This commission promotes radioamateur activities on HF and the Dutch Young Ladies Club is part of it. 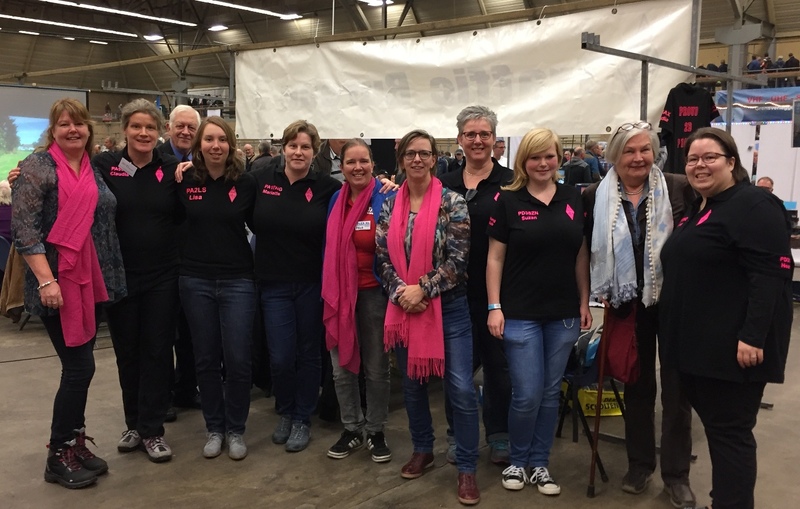 From left to right: Bertina PA2BTA, Claudia PA5CT, Lisa PA2LS, Mariëtte PA1ENG, Barbara PB2Z, Karin PA1KBN, Sonja PD4SON, Suzan PD3SZN, Magda NL13543 and Heather PD3GVQ. ← Proud 2B PI4YLC at HAM radio 2016!